At the Future Renewable Electric Energy Delivery and Management (FREEDM) Systems Center at North Carolina State University, U.S. universities and industry partners focus on modernizing the electric grid using advanced power electronics. As one of the founding faculty members at FREEDM System Center, Dr. Subhashish Bhattacharya’s research focuses on power electronics and power systems including DC Microgrids. Dr. Bhattacharya discusses how Controller Hardware-in-the-Loop (C-HIL) reduced the cycle time of design, validation and testing of DC Microgrid controllers from academia to industry. What are the major challenges we need to address before we can design, implement, and validate a DC microgrid control platform? With integration of different load sources into the DC microgrid, the major challenge is how well these loads and sources could be modeled. And the question always remains on the potential of interactions between them. We need to design the controls such that it is not only controlling the load or source for which it is designed, but also able to suppress any kind of oscillations or interactions between different loads and sources. In other words, these controllers must become smart and agile. What about the limitations of offline simulations compared to real time simulation systems? Offline simulations have major limitations. Our controllers tend to be ideal without considering the non-idealities of the controller as well as the load or the source. These non-idealities in power electronics is what often is the source of the control interactions. Also, they do not allow us to investigate all the corner cases of a controller. Why is Controller Hardware-in-the-Loop platform a required step before implementation and validation of microgrid controllers? The Controller Hardware-in-the-Loop is a very important and required step before actual validation or implementation because we can take care of all these corner cases. And design our controllers as if we had the real hardware sitting in front of us. 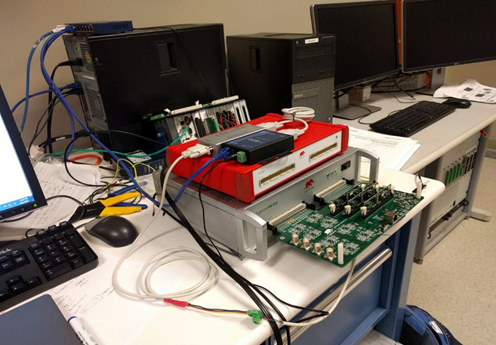 Can you give an estimate how this C-HIL system accelerated design and testing process of your controllers? For a small DC microgrid system, I could safely say that you would reduce three months to four months without the Typhoon to almost one or two weeks. Can you just very briefly describe your Typhoon HIL system setup? We used one Typhoon HIL system to emulate our system, which you can think of the backbone system. Now you have a representation as if you have a real system, where you have a real DC bus as the backbone. On this bus, now you can create all kinds of disturbances, faults, and all kinds of standard cases, regulations that you may need to meet. Then you have these other Typhoons, which are hanging off from that system as loads and sources. So now you have a real controller which is connected to the Typhoon box, and the Typhoon is emulating the real power electronics converter system. From your experience, how realistic are these models of loads, sources, and other components on a DC microgrid? The Typhoon system is very realistic, because one can emulate a real converter, a real switching converter so there is no average modeling required to be done. There is no extrapolations to be done. You're really dealing with as if you have a real converter sitting in front of you. It could be a DC-to-DC converter. It could be a DC-to-AC, or AC-to-DC, or even AC-to-AC converters with actual switching. And that is what makes the difference because now you're really designing a controller that is for the real system. Let’s talk about communication protocols. 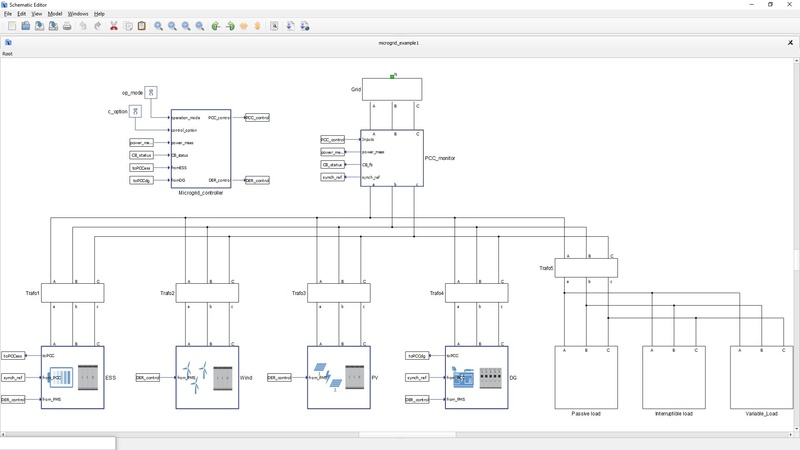 So how did you test a complete Modbus communication network for DC microgrid controls? Modbus operates on the master-slave concept. 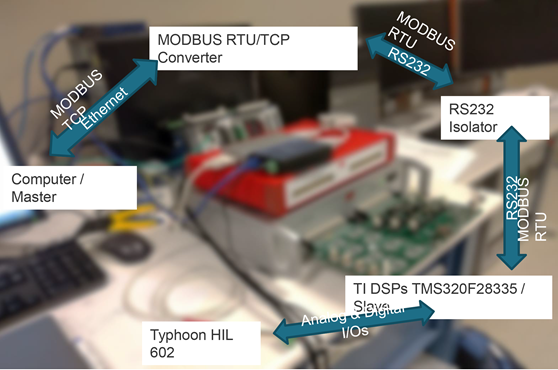 We have set up communication from the Modbus master from one Typhoon to the other Typhoons, which are operating on the master-salve concept. This would be exactly the same as one would do in a real implementation, or real industrial implementation. So this mimics pretty much the real scenario. And what about cyber security? How did you test a fool-proof communication protocol to prevent a cyber security attack with C-HIL? From the cyber-security point of view, what we have tried out a couple of things. One is that you can go into sophisticated protocols like IC 61850 with cyber-security built in to make sure that the system is completely safe. With Modbus, we were emulating a hacking kind of thing, where we would be able to extract information about different controllers from sitting at one terminal. We are trying to showcase what kind of firewalls or what kind of features you need to build in. So the controller can figure out that a request is coming not from within your DC microgrid but from outside. That is what we have been able to implement and showcase. As an academic with industry experience, I think you have a very interesting perspective on how this technology is also useful from a commercial point of view. How did this hardware in the loop help you transition from a lab setting to field deployment for industry? Well, the hardware in the loop enormously actually reduces your cycle time of transitioning from active research to a field deployment and industry validation part of it. There is no difference between the Typhoon box and your actual converter system from the controller perspective point of view. So you have a very high level of confidence that this is going to work as designed and as validated in a real system. Therefore the transition to the real system becomes very short. How did this help you as a researcher to get funding and to publish your research? From the funding point of view, we can very quickly try out many scenarios, and emulate conditions and fault conditions than would be possible with an actual hardware. This whole concept of rapid prototyping – rapidly going to making sure you have gone through all the corner cases – allows you to make a very comprehensive test case. So it takes away all those unknowns and questions. And enormously helps to answer questions that the funding reviewers typically have because you can anticipate and give those answers. Do academic journals accept HIL results instead of full hardware results? From my experience, they do accept the HIL results. And if there is still a question, you basically need to just validate one HIL result with one hardware result. Again, from my experience, the HIL results are actually acceptable because we have also shown through our research that the HIL results and hardware results are on top of each other. So how would you describe your experience with Typhoon HIL compared to other HIL solutions? One thing that I can always say is that the learning curve for my students with the Typhoon HIL was the shortest. And I can say that the Typhoons HILs have offered the most robust systems. I think where Typhoon stands out compared to other real time systems, is robustness and also the ease of use. What is the biggest possibility of this technology in your research? We have been able to implement and show, through our papers and research, how to use multiple Typhoons together in a real system. Not from the point of view of just using multiple Typhoons for the sake of using it, but to emulate a real system as you would see it in the field. Things in the world are distributed so you are really emulating a distributed control system with power electronics. What’s the one word you would use to describe your experience with HIL?